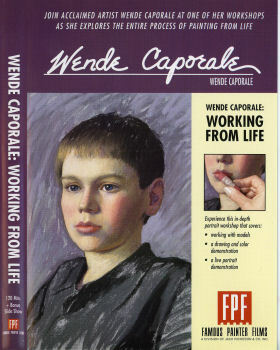 Wende Caporale is a master of the portrait. She is known and respected nationwide for her insights with people and skills with oil and pastel. Wende understands the subtleties, the techniques and the challenges. She knows what makes a good portrait. Most of all, she knows how to use color to bring out character, depth and understanding. Now you can gain much of the inspiration and technical knowledge Wende has to offer by taking her workshop in the comfort of your own home on video or DVD. Filmed in front of a live workshop audience, this two hour video explores just about every aspect of portraiture, from working with models to explanation of color theory, lighting, and media technique. In this video/DVD, Wende examines portraiture for pastels, oils, and drawing. She makes learning the intricacies of great portraiture a joy! 120 minutes.